Planmate offers the largest range of planfiling and planstorage products in Australia. The vertical and mobile plan filing systems in this on line store will give you the best possible overview of what is available in this market and industry. We have selected the most commonly used products from the most 5 popular brands in New Zealand. Their plan filing products are conveniently categorized and presented in an online shopping portal concept to maximize comparison of similar items from the 5 biggest plan storage brands. There are over 15 different plan clamps available. 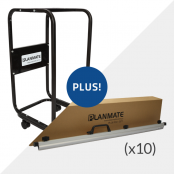 These plan clamps can all be used in combination with either a mobile plan trolley or wall mountable plan rack. The commonly known 'plan clamp' is also known as a plan binder, plan holder, plan hanger, plan rack or plan drawing hanger. They are available in 4 different sizes ranging from A0, B1, A1 and A2. If you are not sure what size paper, document, poster or drawing you are trying to file, please refer to our comprehensive information page about ISO 216 paper sizes: Plan Filing and Plan Storage paper sizes. Each plan clamp brand in this online store has its own unique features. The Planmate brand has a full range of aluminum anodized double and triple wingnut clamps and is the only brand offering all 4 sizes A0, B1, A1 and A2. The Planhorse brand has a unique design and color scheme with its distinguishing white and red clamp, clips and supports. Hang-A-Plan is the only manufacturer with a patented QUICKFILE plan release system available in the size A0 and A1. Draftex offers a plan hanger line-up including transparent clips for easy tagging and filing purposes. THE UNIVERSAL brand can be considered if you are looking for a BUDGET style plan clamp without compromising on quality and reliability. The plan clamps can be used individually, taken to site or to meetings and can be stored and grouped in either a mobile castor wheel based plan trolley or a mountable wall rack. 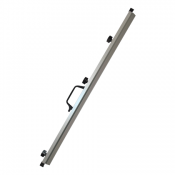 The mobile plan trolley or plan racks are your best option if mobility across the office or at the building site shed is required. 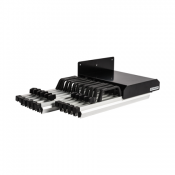 Alternatively the wall mountable plan rack can be used to permanently store your plans on site or in the office without compromising on accessibility of your files. 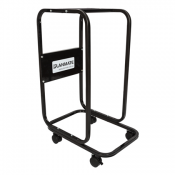 The mobile plan trolley is also known as a planhorse, planhorse trolley, frontloader trolley or vertical plan holder rack for drawing storage. With warehouse locations in Sydney, Melbourne, Brisbane, Adelaide and Perth we are able to ship all items from our online shop in the shortest possible time frame and at the lowest possible cost .